So, you hope to see Inverness in two days as part of your Scottish vacation. OK, you will find the itinerary here is all you need. Why? Because it’s tried and tested and Johanna wrote it for clients. We mention Inverness at several places on this site as it features in many Scottish tours. (The links are further down the page.) Often called the Capital of the Highlands, this small city of c. 60,000 inhabitants (and growing fast) services all of the Northern Highlands and has plans for further expansion. One day its road system will catch up as well. Inverness Castle dates from 1836 and isn't open to the public yet - but there is a new viewing platform at the top and it is being developed for visitors at present. Bonnie Prince Charlie's forces blew up an earlier one. (See? We told you the clansfolk treated the place badly.) It has been a defensive site since the 11th century. Truth to tell, Inverness doesn’t have many really ancient buildings in the way that, say, Edinburgh does. Instead of couthy wee Highland crofts like Brigadoon, you’ll find it’s a quite handsome, practical, well-resourced kind of place, with all the ‘High Street’ stores of any other town/city in Scotland, as well as retail businesses servicing the high number of visitors. Because it is very much on the tourist map, it also has a great choice of accommodation, restaurants and things to do. And it also simply feels busy, no matter when you visit. Cosmopolitan would not be too strong a word to use here. Inverness and the Loch Ness area are also heavily publicized by tourism promoters at both national and local level, much of it capitalising and building on the decades of interest there has been in the Loch Ness monster phenomenon. So, I expect you'll want to go there. These itinerary suggestions should not be treated as an endorsement as such. We believe that Scotland has many other beautiful and rewarding places to visit. Inverness Street scene. Gosh, there seems to be a lot of it up for sale or let (2016). Still, the tree is nice. If you like high-season holiday bustle, you’ll like this small city with a river running through it. If you like off-the-beaten-track, or cute/quaint little Highland villages or just rural tranquillity, then two days in Inverness will be more than enough! Anyway, here’s the Inverness itinerary or checklist, including some Inverness accommodation suggestions, compiled by Johanna, our guide. This is how she suggests you spend your time in the Highland capital. Really, this should be ‘48 hours in Inverness’ as the format is: day 1 - get there with time to see something of the city; day 2 - all day touring; day 3 - a morning excursion, then depart. There are also some options. Got all that? Finally, we have to point out that if you book accommodation via this page then we benefit (in a small way!) through an affiliate arrangement. Everything mentioned here is accessible by foot or public transport if you don’t have a car. We assume you have never been to this Highland city before. Pentahotel Inverness - a very central modern hotel close to the railway station – with city centre bars, restaurants and attractions on your doorstep. A city sightseeing bus tour as a good introduction and overview to Inverness. See the historic buildings, the shopping area and the River Ness as well as the Caledonian Canal locks and visit Holm Mills shopping village. Tours operate from March to September, daily. You can get on or off at any stop along the route. Pedestrian bridge over the River Ness in Inverness. Eden Court Theatre in background. Walk along to the Ness Islands – a group of small islands in the middle of the River Ness connected by attractive Victorian suspension bridges. A perfect spot for a gentle walk, run or a picnic. Paths are level and suitable for all abilities. OR: walk up to Castle Hill to see the bronze statue of Flora MacDonald, erected in 1896. She was a famous Jacobite lady who helped Bonnie Prince Charlie escape after the Battle of Culloden. Looking south, against the light, from the site of Inverness Castle on a cold April day. Flora MacDonald statue looks south as well, over the River Ness and down the Great Glen. You will visit this battle location tomorrow and hear more about the Jacobites. 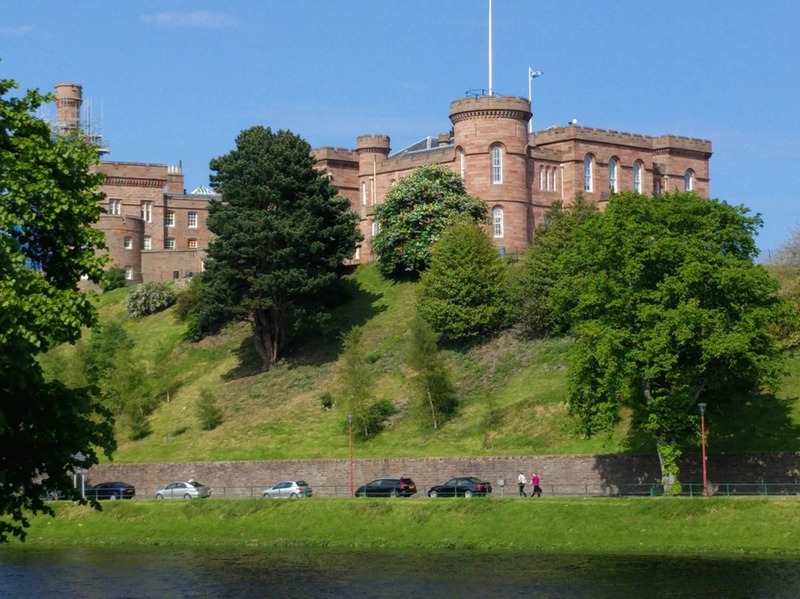 The large building behind the statue is known as Inverness Castle, built in 1836. It is currently the courthouse. There has been a fortification on this site for many centuries. It is floodlit at night. Enjoy great views over the city and down the Great Glen. Only the castle grounds are open to the public but the building does have a new Castle Viewpoint - but there is a charge and you are advised to book. The Mustard Seed at 16 Fraser Street. Based in a former church on the bank of the River Ness. Enjoy a meal in this unique space; with a double-height ceiling and magnificent open log fire. Try Scottish black pudding, apple and walnut salad and a local 21 day aged rib-eye steak. Enjoy some live folk music at Hootannany - a friendly and award winning pub and music venue. Find it at 67 Church St. The popular Urquhart Castle overlooking Loch Ness. In this strategically important position, it formerly guarded the routes thrugh the Great Glen. This tour leaves from Inverness Bus Station and lasts 3.5 hrs. Learn about the Loch Ness Monster myth. Enjoy a guided coach tour of the area as well as a cruise on Loch Ness. Your guide will tell you all about the fascinating history and legends plus you get one hour at the famous Urquhart Castle on the banks of Loch Ness (pictured here) as well as a trip to the Loch Ness Monster Exhibition Centre. Other tour combinations are available – check the Jacobite website for details and seasonal variations. OK, I've sneaked this one in to Johanna's original itinerary because we found this place, Coffee Affair, so friendly. Also because they are dog-friendly though you won't find a lot of dogs there. Great for, well, coffee and stuff and damn fine lunches. Coffee Affair is in Church Street, right in the centre of town. It's going to be our refreshment stop every time we come to Inverness from now on. Visit Culloden Battlefield. This is the atmospheric site of the last battle fought on Scottish soil, in 1746, between the rebel forces of Bonnie Prince Charlie and the Hanoverian Government of Britain. It had European implications - and further afield - and the National Trust for Scotland’s visitor centre is both impressive and informative. A quiet off-season afternoon in Inverness's Victorian Market. Situated in the heart of the Inverness Old Town shopping area. 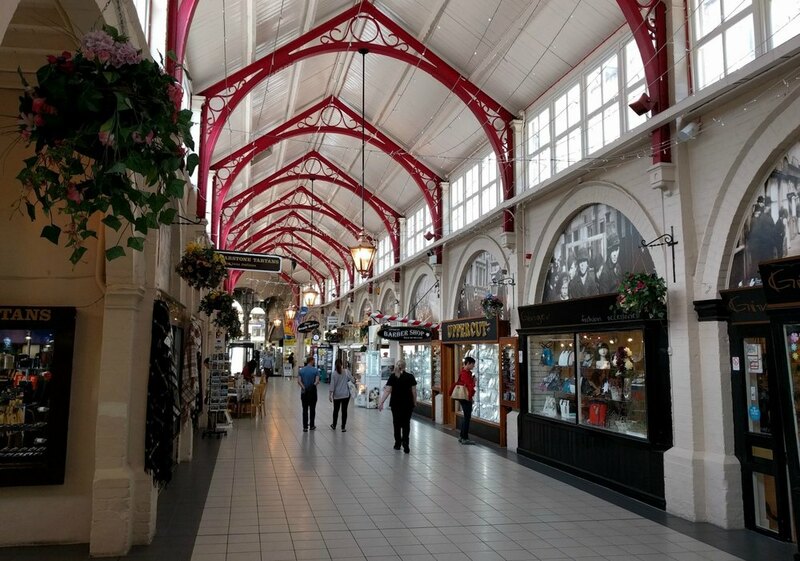 This roofed indoor market dates from 1876 has a wide range of small independent shops and cafes. Have a look at the sandstone entrance archway in Church Street to see where fish sellers used to sharpen their knives! The Old High Church of Inverness. Visit Inverness Museum and Art Gallery. Experience the art, history and heritage of the Highlands through unique artefacts. Modern displays and interpretation help you discover Gaelic culture and language, geology, wildlife and much more. Learn how to say some Gaelic words and even try on an 18th century style highland kilt! Free entry. There is a nice cafe in here too called Cobbs Tea House (if you missed lunch!) as well as small gift shop selling stylish Scottish gifts and cards. Riva Restaurant - 4-6 Ness Walk , Inverness IV3 5NE. Classic Italian dishes and pizzas in modern setting overlooking the River Ness. Eden Court Theatre – there may be a play or film to interest you. Eden Court is Scotland's largest combined arts venue, showcasing theatre, cinema, arts and education performances for the Highlands & Islands. Eden Court, Bishops Road, Inverness IV3 5SA. This is decision time. We said 48 hours in Inverness, so that means you depart at some point in the afternoon. Aside from the shopping choice this morning, there is one other excursion worth the effort: a visit to Fort George, the best example of a surviving 18th-century military fortification anywhere in Europe. Basically, this huge military base defends a headland sticking out into the Moray Firth (good for dolphin-spotting). It was the Hanoverian government’s response to the last Jacobite uprising that you learned about on the Culloden visit. Never again would the Highlands of Scotland be a potential hotbed of rebellion. The fort has never fired a shot in anger. It still has a military presence. It’s a whole morning’s visit, by the time you walk the ramparts, take in the regimental museums, the cafe and so on...then it’s time to leave the Inverness area. Where will you go: towards the far north, sometimes marketed as North Coast 500. Or over to Torridon or perhaps Skye. Or towards Orkney for a whole different perspective on Scotland. Here are our thoughts on Loch Ness - and also that monster. ...and here is some information on places and things to see near Inverness. Places to enjoy after Inverness.